I adore clothes! And I live to be a clothes horse. But I’m also frugal and want the best deal on the trends, and the best steals on the classics. I thought I’d start a blog outlining my good finds for the week and where I’m finding them. I adore vintage/retro looks – I’m a swing dancer, I love classic work pieces with a twist – I’m a workaholic and I love something a little different – cause I’m quirky myself – Clothes are art! Wear them well! Sometimes I’ll post closetfuls, sometimes just a good statement piece, either way – I’m here to show you what’s going on in my head! 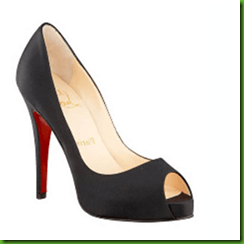 My first start is something I want to own once in my lifetime…a stunner – the classic Louboutin heel…for $187 – way cheaper than the $785 it’s going for!